TONKAWA President Violet Tunohun arrived on time and since many were ready to eat she opened the luncheon before noon. Small in number the Tonkawa group gathered in gigantic good spirit. Portuguese, Indian captive, Manuel Flores provided the blessing for the TONKAWA members and visitors this past Sunday. Some of the other members that didnt attend were not in the best of health or busy with friends and relatives and others, no doubt, took football advantage of the bright Indian summer warmth of the day. Gwen Cooper joined the group and told of her journey from Colorado to New Mexico and Arizona. It started very sadly with a death in the family but the vistas and people she met on the trip back lightened the load on her heart. We were glad she came in and was able to share her sorrows. We sincerely add all our condolences. Stories continued about Manuel and Celia and their participation with Fr. Joes holiday dinners. Santa and Mrs. Claus had to make an emergency visit to the hospital. They got priority service. Celia is still recovering and trying to get stronger for their next cruise. In the conversation the topic continued about the possibility of a craft project for our elders came up  Dolls in tribal and international outfits. Our faithful TONKAWA members keep the cooking pots bubbling and the happy smiles ready. The dishes are passionately delicious. These food selections are made with lots of love and care for a very festive New Year luncheon: pasta chicken casserole, Greek green salad and sides of macaroni and flat pretzels with good strong hot TONKAWA coffee made for a fine luncheon! Our next TONKAWA meeting is at noon Febuary13, 2011 at the IHRC offices, 4265 Fairmont Ave. San Diego 92105. There is plenty of good parking with easy access. Violet and Roy put away the table and cleaned up the room. 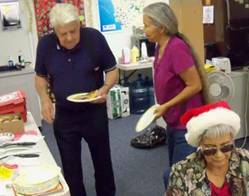 It was a good time to come together for our Elders NEW YEAR TONKAWA meeting.